As of yesterday, Mindoku can speak Russian! As always, the language selector can be found on the top-right of the layout in Mindoku (this blog is English only). Or here is a link to the Russian version of Mindoku for your convenience. Since we have the multi-language infrastructure in place, adding new languages is very easy. Let us know if you want to help us translate Mindoku to your own language, we’d be happy to widen the array of available languages! Like the title says, thanks to our user mert, Mindoku now speaks Turkish! Navigate to Mindoku and you’ll see the language selector on the top-right of the page. Or here is a link to the Turkish version of Mindoku for your convenience. Since we now have the multi-language infrastructure in place, adding new languages is very easy. Let us know if you want to help us translate Mindoku to your own language, we’d be happy to widen the array of available languages! The 17th Mind Sports Olympiad was held at The University Of London Union from August 16th to the 25th. This years Pentamind title, which is awarded to the player who scores the best results in five distinct games, was shared by UK’s Ankush Khandelwahl and Estonia’s Andres Kuusk (fantunes in Mindoku) both of whom had a total of 492 points out of a maximum 500 points. James Heppell (UK) collected 480 points and 3rd place. 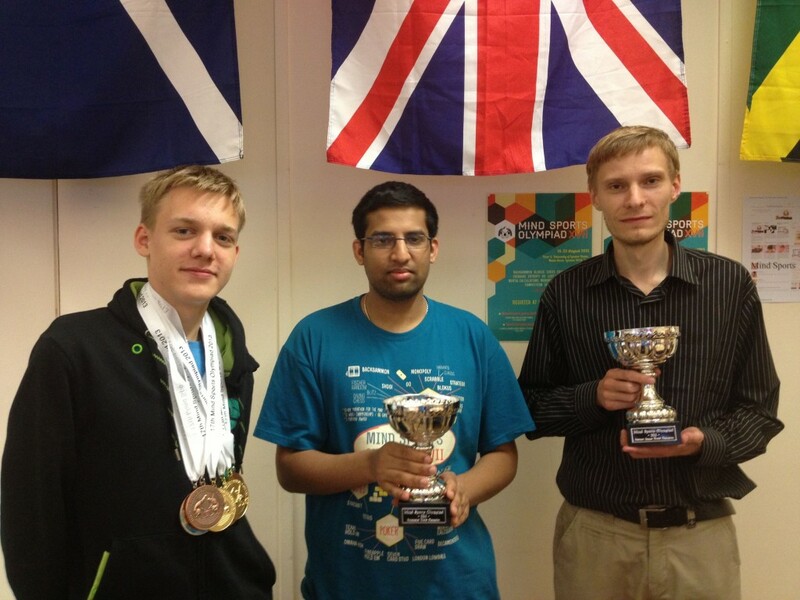 Martin Hõbemägi (left, 5th overall), Ankush Khandelwahl (middle), and Andres Kuusk (right). Summary of this year’s event. Results of all the games. The Mind Sports Olympiad (MSO) is an annual international multi-disciplined competition and festival for games of mental skill and mind sports. The inaugural event was held in 1997 in London with £100,000 prize fund and was described as possibly the biggest games festival ever held. It was the first event of its kind aiming to create an Olympics of the mind, awarding gold, silver and bronze medals for each event. The Mind Sports Olympiad continues to take place every year in England. New game client is released! lightweight, loads a lot faster and needs less resources. We’ll add the rest of the games (chess and its variants, connect four, entropy and card games) as soon as we can. Feel free to discuss the new game client (opinions, bug reports, suggestions, etc) in our forum. Mindoku and Vint databases connected! Mindoku and Vint gamerooms have been connected which means that users in Vint can play with users in Mindoku and vice versa. This essentially means that Mindoku and Vint are just different web interfaces to the same database (users, games, tournaments etc). If you created your account in one portal you can now also log in to the other. However, Mindoku is international and Vint remains an Estonian site. Like also mentioned before one downside of connecting the portals is that because of technical and other reasons all the games played and sudokus solved in Mindoku prior to the big change are gone (about 5000 duel games and 35,000 sudokus). However we think that this was worth it in the long run because now there is a lot more action in Mindoku in terms of number of users online and tournaments. Since it was quite a huge update, there might be some bugs around that we have not yet noticed. If you find one, let us know in the forum or write us an email. As you can see all the action is now available on one page, no need to keep separate browser tabs open for different games. 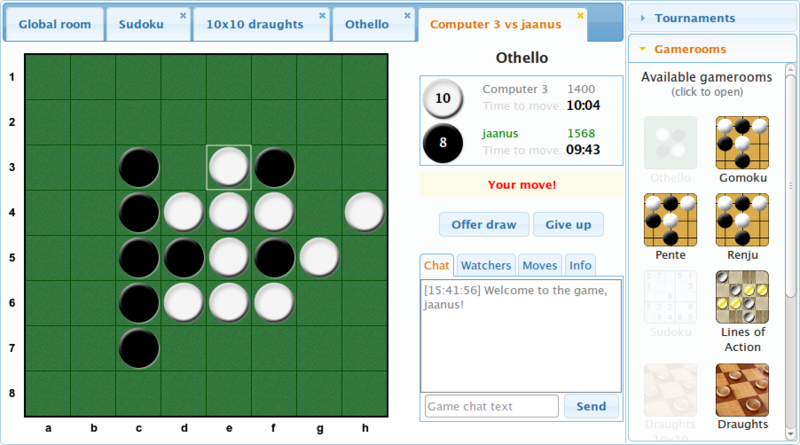 You can see the new client partially even now when you open the Othello game room, however the new version takes one step further and puts all the games and tournaments to one place. 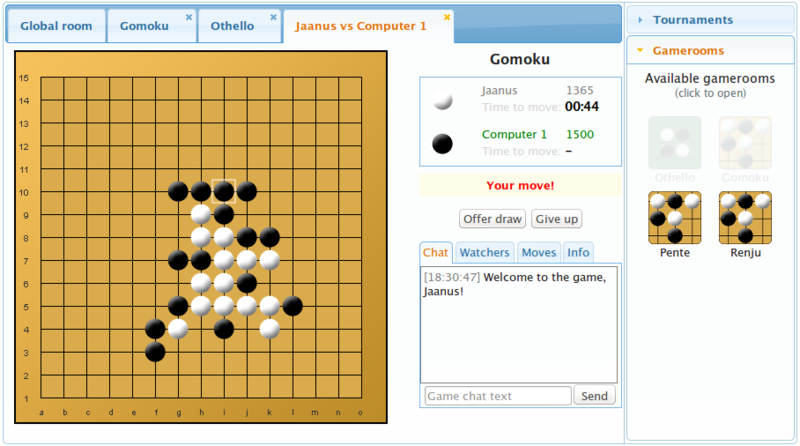 We are currently planning to bring out the first version with support for Othello, Gomoku, Pente, Renju and Sudoku after which we’ll gradually add other games. Unfortunately, since the new version is a complete rewrite on both the client and the server side, then other games (beside the five mentioned before) will be unavailable until we implement them using the new technology. It should not take long however, since we already have the game logics code from the present games. With the current development pace, we should be able to release the first version in about 1-2 months. We’ll keep you posted! NB! Every user can create a tournament themselves, so you can have a challenging competition with your mates whenever you want! There is a link for creating a new tournament on the tournaments page. The tournament consists of eight rounds organised by WPF members from eight countries. The hosts will be Czech Republic, Germany, India, Italy, Serbia, Turkey, UK, USA. The dates will be announced soon. All the sudoku players can take part and compare their results with the top players without leaving their home. In the next days the registration will be launched at our web page. Only registered players will be included in the final WPF ranking. A few event dates have been set. The schedule has been updated with relevant data. 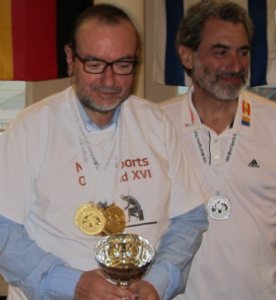 XVI world championships in mind sports pentathlon, better known as the Pentamind world championships was won by italian Dario De Toffoli with 489.14 points out of maximum 500. De Toffoli destroyed the field of more than 200 players from 32 different nations beating silver medallist Francisco Paco Garcia De La Banda from Spain by 22 points. The bronze medal went to James Heppell from UK who lost silver by mere two points. The most prestigeous multievent tournament in mind sports lasted no less than nine days and 104 hours with more than 50 different mind sports played from which five best results were summarised for each participant for the overall standings. The event was led for most of the time by englishmen James Heppell and David Jameson, before De Toffoli took over in the seventh day when winning an aquire tournament in a style and increasing his points tally to a whopping 485 points. There was no real danger for the italian legend since then and he even got some extras in the final day with third place in lost cities. 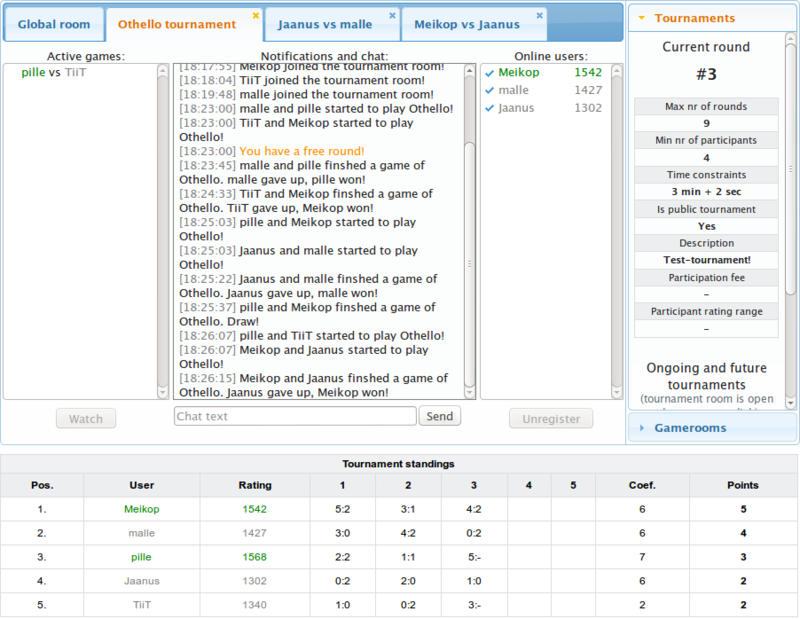 The other events in the De Toffoli´s top 5 were oware, backgammon and mastermind. With this great victory the italian became only third person in history who has won the prestigeous title more than once, the englishmen Demis Hassabis and David Pearce being the others. As the title was first time won by De Toffoli already in 2002, the ten years gap between world champion titles is an unique record in the event. De Toffoli now has 8 medals in the Pentamind – two golds, two silvers and four bronzes – an achievement which is also a record. 11) Alain Dekker, Republic of South Africa.